Turbomolecular pumping systems are the most reliable and cost-effective means of producing high vacuum. They are portable, fast-starting, and require little in the way of support systems. The Varian turbomolecular pumping systems are fully assembled. All pumps have silicon-nitride ceramic bearings for a long, clean, and virtually maintenance-free life. 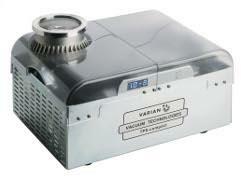 Varian MacroTorr pumps deliver the highest speed/compression-ratio performance in the smallest envelope. These are true wide-range pumps, capable of operating at higher foreline pressures than standard turbomolecular pumps. Should you not find a turbo system in our catalog to meet your requirements, please contact your local Varian representative. We also specialize in designing and building custom vacuum systems. We can provide just the right vacuum solution to meet your requirements. Very compact, oil-free, economical, self-contained pumping system. 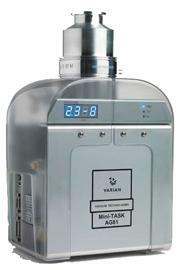 The Mini-TASK AG81 is a compact, portable, fully integrated turbo-pumping system mounted in a handsome housing, containing a Varian Turbo-V 81-M turbomolecular pump and a 10 l/min. diaphragm pump.